VALLEY BREEZE LIVING EDITION | JULY 12-18, 2018 CALENDAR 21 hold items and more. Some items are half price. NORTH SCITUATE FARMERS MARKET – at the Village Green, Scituate Art Festival Grounds, West Greenville Road and Silk Lane, North Scituate. Fresh produce, vendors and crafters. Visit www.farmfreshri.org . 9 a.m. to noon. CUMBERLAND LIBRARY FRIENDS BOOKSTORE – Friends Bookstore at the Cumberland Public Library offers used books, sorted and categorized, for sale. Books are $1 or less. Book donations are also accepted. 9:30 a.m. to 12:30 p.m. 1464 Diamond Hill Road, Cumberland. Call Nancy at 401-334- 3268 with questions. HISTORICAL WOONSOCKET WALKING TOUR – The Museum of Work & Culture offers walking tours of historic Woonsocket each Saturday at 10 a.m. through Aug. 25. Guides will lead groups along the banks of the Blackstone and Main Street. Tours are $8 for adults and $6 for students and seniors. The tours are free for children under 10 with a paid adult admission. All participants will also receive complimentary admission to the museum. Groups are limited to 15. Pre- registration is suggested. Call 401-769-9675. HOW TO READ THE LIBRARY REPERTOIRES – Discover your family his- tory at the American French Genealogical Society, 78 Earle Street, Woonsocket. 10 a.m. LEARN ABOUT RABBITS – Michelle Skorupski and her bunnies will present an informational program on rabbit care in the Children's Room of the Cumberland Public Library, 1464 Diamond Hill Road, Cumberland. Children ages 6-12 can hear a rabbit-related story and be introduced to caring for a rabbit. To register, visit www.cumberlandlibrary.org or contact the Children's Room at 401-333-2552, ext. 3. 10 a.m. VETERANS MEMORIAL MUSEUM – is open every Saturday from 10 a.m. to 4 p.m. The museum is located at 78 Earle St., Woonsocket. Admission is free for veterans and students. Call 401-222-9025. 10 a.m. KELLY HOUSE MUSEUM – hosts free out- door recreation and science exploration every Saturday in July and August. Families are encouraged to stay after Science Saturday to explore the Kelly House Museum, 1075 Lower River Road, Lincoln, the Blackstone River and Canal, and the Blackstone Bikeway. 10:30 a.m. NORTH SMITHFIELD LIBRARY LEGO CLUB – meets Saturdays at the North Smithfield Public Library, 20 Main St., Slatersville. Use the library's bricks to cre- ate something unique. Open to all ages. No registration necessary. For more information please call the library at 401-767-2780 or visit the library's website calendar, www. nspl.info . 11 a.m. OLD BUSINESSES FROM WOONSOCKET R.I. EXHIBIT – presented by The Woonsocket Historical Society, 42 South Main St., Garden Level, Woonsocket, behind the Museum of Work & Culture. Open every Wednesday and Saturday, noon-3 p.m. Artifacts from past businesses associated with the city of Woonsocket on display. Call 401-356-0067. Noon to 3 p.m. RIVERWALK TIMES CONCERT SERIES – featuring the Jesse Liam Band, at the the Jesse M. Smith Memorial Library, 100 Tinkham Lane, Harrisville, in front of the library at the Burrillville Farmer's Market Pavilion. Concerts are free and move inside the library during inclement weather. For more information, call the library at 401-710- 7800. 6 p.m. PAWTUCKET RED SOX VS. SYRACUSE CHIEFS – at McCoy Stadium in Pawtucket. Call 401-724-7300 or visit www.pawsox. com . McCoy Stadium, 1 Ben Mondor Way, Pawtucket. 6:15 p.m. JIM BRADY TRIO – performs at Woodlawn Baptist Church, 337 Londsale Ave., Pawtucket. The warm-up act with Just Us Four begins at 6:30 p.m., and the Jim Brady Trio performs at 7. The concert is free and will be held in the main church auditorium. CDs and other materials will be available. MUD MORGANFIELD – the son of the leg- endary Muddy Waters will perform at Chan's, 267 Main St., Woonsocket. Tickets are $32 in advance and $35 at the door. Call 401-765- 1900 or visit www.chanseggrollsandjazz.com . 8 p.m. Sunday July 15 CHRISTMAS IN JULY VENDOR FAIR – hosted by Fit For Life Training Complex, 970 Douglas Pike, Smithfield. Features more than 50 crafters and vendors. 9 a.m. to 3 p.m. FARMERS MARKETS AT DANIELS FARMSTEAD – The eighth season of fresh organic vegetables are growing in the Daniels Garden. Other vendors will be on hand offering locally grown fruits and veg- etables, grass-fed natural meats, goat milk soaps, gourmet foods, fancy fudge, and more. The grill will be open from 11:30 a.m. to 2:30 p.m. Contact Justine Brewer at justine @ southwickszoo.com or 1-508-726-2042. 11 a.m. to 3 p.m. EAST PROVIDENCE HERITAGE FEST – sponsored by Eat Drink RI featuring a live jazz brunch with he New Providence Big Band at Pierce Memorial Field in East Providence. More details can be found at epheritagedays.com. 12:30 p.m. to 2 p.m. AUTHOR SHAWN FLYNN VISITS SMITHFIELD BARNES & NOBLE – 371 Putnam Pike, to share his inspirational pet rescue story. Flynn's book, "The Kitty Who Rescued Me After I Rescued Him," reveals how the pets we love sometimes turn around and care for us. 1 p.m. CUMBERLAND WIDOW SUPPORT GROUP – Held every Sunday at 2 p.m. The first two Sundays of the month are held at Four Corners Community Chapel, 200 Angell Road, Cumberland. The second two Sundays are at Brookdale Cumberland, 10 Old Diamond Hill Road. Call 774-266-7923. NORTH SMITHFIELD SUMMER CONCERT SERIES – at the Slatersville Congregational Church Common, 25 Green St., on Sundays, from 5 to 6:30 p.m. Bring blankets and lawn chairs. This week: Branded performs. 5 p.m. RIVERFRONT CONCERT SERIES – at Veterans Park Amphitheater, corner of Roosevelt Avenue and Exchange Street, Pawtucket. Sundays at 6 p.m. This week: Nickel Jukebox. Monday July 16 HAPPY NOTES CHORUS – Singing group open to all seniors and meets every Monday at the Salvatore Mancini Resource and Activity Center, 2 Atlantic Blvd., North Providence, at 10 a.m. Call 401-231-0742 or email sunsense401@msn.com. Tuesday July 17 VETERANS MEMORIAL MUSEUM – is open every Saturday and Tuesday from 10 a.m. to 4 p.m. The museum is located at 78 Earle St., Woonsocket. Admission is free for veterans and students. Call 401-222-9025. RICK MORIN'S RHYTHM ROOM – in the Children's Room of the Cumberland Public Library, 1464 Diamond Hill Road, Cumberland. Children age 4 to 12 experience Rhythm Imaginarium: Where the imagination runs free and rhythms are easily made using buckets, cans, voices, hands, and real percus- sion instruments. Tickets for 45-minute inter- active program available in Children's Room for 50 cents each. Visit www.cumberlandli- brary.org or contact the Children's Room at 401-333-2552, ext. 3. 6 p.m. Wednesday July 18 THRIFT SHOP – at Epworth United Methodist Church, 915 Newport Ave., Pawtucket. Variety of children's, men's and women's clothes. Shoes, handbags, and jew- elry, too. Open Wednesdays 10 a.m. to 1 p.m. OLD BUSINESSES FROM WOONSOCKET R.I. EXHIBIT – presented by The Woonsocket Historical Society, 42 South Main St., Garden Level, Woonsocket, behind the Museum of Work & Culture. Open every Wednesday and Saturday, noon-3 p.m. Artifacts from past businesses associated with the city of Woonsocket on display. Call 401-356-0067. Noon to 3 p.m. BINGO – at Forand Manor, 30 Washington St., Central Falls, Wednesdays and Fridays. The doors open at 4 p.m. and bingo starts at 5 p.m. The kitchen will be open. SCITUATE SUMMER CONCERTS – Billy Harpin Band will perform. Bring your own seating. Non-Alcoholic beverages welcome. May be canceled due to inclement weather. North Scituate Gazebo, 606 West Greenville Road. There will also be a food truck event at this concert. 5 p.m. RIDES OF DISCOVERY – meet at the Blackstone River State Park Visitor Center, I-295 northbound in Lincoln, and will venture south to Lonsdale, for a 7.5 mile round trip. 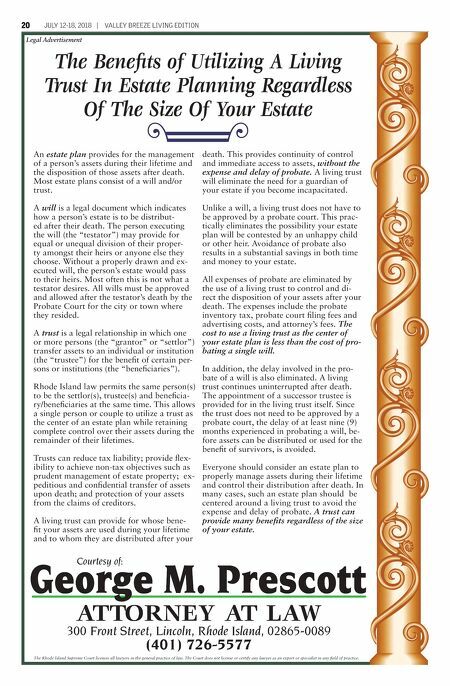 Visit BlackstoneHeritageCorridor.org . 6:30 p.m. Thursday July 19 SUMMER SCIENCE HOUR – for junior sci- entists, ages 4-6, at the Cumberland Public Library, 1464 Diamond Hill Road. Every Thursday at 10 a.m. through Aug. 9. Hear a story and be hands-on scientists. Registration is required individually for each session, which will have different themes. Space lim- The Blackstone River Bikeway Patrol is leading "Rides of Discovery" along the Blackstone River Bikeway on Wednesdays at 6:30 p.m. through Aug. 23. The Blackstone River Bikeway Patrol will lead a RIDES OF DISCOVERY bike ride on Wednesday, July 18, at 6:30 p.m. Meet at the Blackstone River State Park Visitor Center, I-295 northbound in Lincoln, and venture south to Lonsdale, for a 7.5 mile round trip. Visit BlackstoneHeritageCorridor.org . See THURSDAY, Page 22 From page 12 Saturday July 14 ACROSS 1. Begetter 6. Arrived extinct 9. Lacking the power to hear 13. Epic 14. Aboriginal Jap- anese 15. Jar used for cooking 16. British nobleman 17. Smart 18. Israeli states- woman 19. Outer space mat- ter that reaches the ground 21. Instrument 22. Infections 23. Holiday (infor- mal) 24. Spanish be 25. Not even 28. Chewie's friend Solo 29. Garments 31. Geological times 33. Music City 36. Cubes 38. Important Chi- nese principle 39. Closes tightly 41. Forms a bound- ary 44. Knife 45. Plants of the lily family 46. A turn around the track 48. Midway between northeast and east 49. Type of degree 51. Midway between north and north- west 52. Profession 54. Musical note patterns 56. Deeply cuts 60. Muharraq Island town 61. Emaciation 62. Weaver bird 63. One point east of northeast 64. Scherzer and Kershaw are two 65. Rice dish 66. Nasdaq code 67. Danish krone 68. Enzyme DOWN 1. Carpe __ 2. Wings 3. Loose soil 4. Earnhardt and Jarrett are two 5. 3 feet 6. Fasts 7. Erstwhile 8. Diving seabird 9. Houses 10. Ancient Greek City 11. Type of skirt 12. Greek village 14. Estranges 17. Scottish island 20. Express delight 21. Cosmopolitan city 23. Letter of Hebrew alphabet 25. Largest English dictionary (abbr.) 26. Flow 27. Shoal-forming fishes 29. Footwear parts 30. Schedule of events 32. Songs to one's sweetheart 34. Test for high schoolers 35. Enthusiasm 37. Streets have them 40. One point east of due south 42. Cut the grass 43. Rattling breaths 47. For each 49. Marketing term 50. One who chal- lenges 52. Sword 53. Polio vaccine developer 55. Film version of "Waterloo Bridge" 56. Want 57. Rhythmic pattern in Indian music 58. Young hawk 59. Harmless 61. Small amount 65. 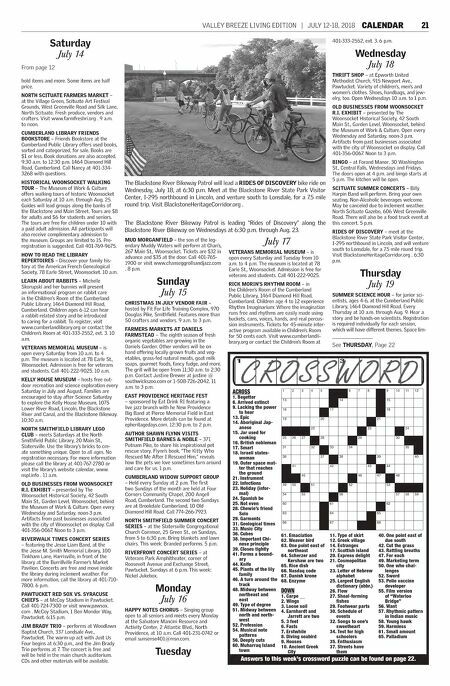 Palladium Answers to this week's crossword puzzle can be found on page 22.